This is a wonderful collection of Natalie Cole. It includes some new and some old, including some songs mixed like she did "Unforgettable" with her father's voice. There are already some very detailed reviews for this CD, so I'll keep this short. 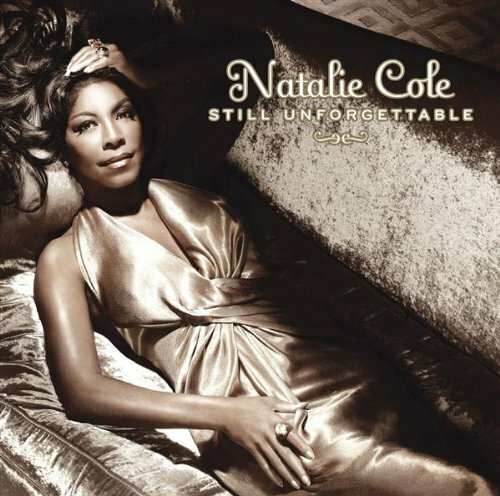 Natalie Cole's "Still Unforgettable" is a very nice Jazz and Swing album with a mostly rather relaxed approach. Cole has a beautiful voice and a remarkable technique and she shows both off, not by belting out songs like "Come rain or come shine" but by giving toughtful, often gentle interpretations of standards and not-so-well-known songs (when have you last heard Peggy Lee's "Why don't you do right"? One of the highlights of this album, by the way...). The musicians are very good, too and the result is a pleasant, well-rounded album that's perhaps not as brilliant as Cole's "Take a look" but still a real joy to listen to. Natalie Cole's voice is flawless on this collection of American Standards. Just like UNFORGETTABLE her emotive yet perfectly controlled vocals seemlessly plays with the lush orchestration. The clarity of her voice reminds one of the great Ella Fitzgerald. It's fun to hear her have fun with the uptempo songs, even inject a bit of soulfulness (remember the power-house voice from the 70's? ), but it is on the ballards where one feels the full range and color of her deceptively simple vocal style. This is highlighted in "You Go To My Head", "Here's That Rainy Day" and "Lollipops and Roses", where she pulls every bit of emotion out of the lyrics. The songs are possibly the lesser known or remembered standards - the kind of songs that makes the listener initially scratch the brow but then go "oh yeah - I remember this". Orchestration is sometimes a bit expected but nonetheless perfect for Cole's voice. Still Unforgettable is a type of "sequel" to Natalie Cole's album called Unforgettable from 1991; and it proves that Natalie Cole is still quite talented as the years go by! The artwork is much like the artwork from the CD entitled Unforgettable so that's somewhat of a minor disappointment; but the quality of the sound is excellent and of course that's what really counts. What's more, if you order this through this website you get an added bonus track and that's a pretty good incentive to buy this album here. "Walkin' My Baby Back Home (Duet with Nat King Cole)" has been digitally remastered and treated to simulate a duet between the grown up Natalie and her late father Nat "King" Cole. It all works very well and "Walkin' My Baby Back Home" is a solid first number with which to start this CD. Excellent! "Come Rain Or Come Shine" gets a slightly jazzy arrangement and Natalie handles the subtle key modulations and tempo changes like the pro she always was! Natalie's voice is clear as a bell and she sounds just as wonderful as ever. "Somewhere Along The Way" gives us Natalie performing a more melancholy ballad but it's every bit as beautiful as "Somewhere Along The Way" or the "duet" Natalie sings with her father at the beginning of this album. "You Go To My Head" has a lounge music flavor to it that enhances the natural beauty of the classic tune; Natalie never misses a beat and I'm very impressed. "Nice 'N' Easy" showcases Natalie singing so well as if it really were "nice and easy" to sing quite this well; and listen for Natalie to do a sublime job on "Why Don't You Do Right?" I first heard "Why Don't You Do Right?" performed by the great Peggy Lee but Natalie takes this ballad and she makes it her own with her incredible sense of timing. Good job, Natalie! "Lollipops And Roses" reminds me of a tune from the late 1950s but I can't quite place it--anyhow, Natalie scores a hit with this. In particular, I really like "Something's Gotta Give" and "It's All Right With Me." These songs have plenty of pep and sparkle; this adds to the CD and proves Natalie can sing along with the best of them any day! The CD ends strong with Natalie Cole performing "How Do You Keep The Music Playing?" which is an exclusive Amazon bonus track. "How Do You Keep The Music Playing?" strikes me with its elegant arrangement and it's a wonderful conclusion to this album. Overall, Natalie Cole fans and fans of classic pop vocals will want this album for their collections. Fans of classic jazz vocals will also want this CD. Not as good as her first, but "Still Unforgettable"
I purchased "Unforgettable -- With Love" 17 years ago, and it has been one of my favorite albums -- and one which developed my love for old 40's & 50's standards, as well as those that Nat King Cole made famous. With that in mind, I eagerly purchased her "Still Unforgettable" album. While her singing is still as good as ever, I was a little disappointed that "Still Unforgettable" didn't grip me as much as her original "Unforgettable" album. There are some "unforgettable" tracks, such as "Walking My Baby Back Home" (the most upbeat duet with her late father to date), as well as "Why Don't You Do Right," "Somewhere Along the Way" and "The Best Is Yet To Come." The rest of the CD consists of up-tempo Big Band arrangements (i.e.,"Nice 'n' Easy"), toe-tapping jazz arrangements ("Rain or Shine" and "It's All Right With Me"), and slow, lushly-orchestrated pieces (i.e., "You Go To My Head," "How's That Rainy Day," "But Beautiful" and "Until the Real Thing Comes Along"), as well as easy listening tracks, such as "Lollipops and Roses." The only track that I felt was really weak was "Something's Gotta Give," which was a bit too repetitive for my tastes. If you purchase this CD through Amazon.com, you get a bonus track, "How Do You Keep the Music Playing," which is also very good. This is not Natalie Cole at her best. She's in pretty good voice, but her singing lacks spark and energy (maybe it has to do with her illness), but Ms. Cole has certainly sounded more lively and sassier on other recordings. This is a throwback to those easy listening albums of the 1950s and 1960s. I was expecting Natalie to take the genre forward. The arrangements are dull rather than lively and some of these arrangements tend to sound the same. What happened to the swing of a song "The Best Is Yet To Come?" Natalie's version is just average. Like her albums "Unforgettable w/ Love" and "Take a Look" from 1991 and 1993 respectively, Natalie Cole takes on the classic American songbook. The results are again breathtaking. Lush, exquisite arrangements and outstanding production complement Miss Cole, who's in fine voice as much as ever. If you buy just one album this year, make it this one.